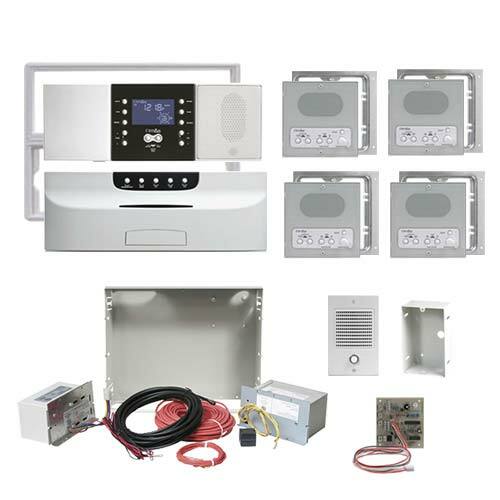 Many homeowners have common problems with their intercom systems. Some problems have simple fixes like a system reset. Others can require extensive repairs with the end result being your system is worn out. With the average life span of most systems being about 20 years, many systems start to have a few common problems that help the customer and the technician realize the system may have just spoken its last word. Scratchy sounds from the speakers. Humming sound from the master unit. Poor sound quality within the speakers. System locked up and is not working. Sometimes systems encounter problems before the end of their life span and the customer must upgrade. This could be due to the lack of parts available from the manufacturers. A few manufacturers like NuTone, M&S, Rittenhouse and Emerson are not stocking parts for older systems. Other manufacturers have parts but they are limited to door and music speakers, and a few transformers. Vastly improved speaker quality will provide excellent music fidelity and crisp communication. For the vast majority of systems, the existing wire can be used. Drywall patching is not required. Even though the new equipment is smaller, retrofit frames cover the larger holes in the drywall. If you encounter any problems during the upgrade, we offer free technical support over the phone. With technology growing and changing everyday maybe now is the time to take a look at upgrading your intercom system. Check out our replacement systems or contact our friendly experts if you need help selecting the proper replacement system. Don't forget to like and visit our FaceBook page. Where can I get a transformer for a IM 3303 and a manual. I can't afford a new one. You may purchase a new C907 transformer from our website. https://qualityhomesystems.com/product-details/c907/ . I’ve also attached the link to the 3303 manual on our website https://qualityhomesystems.com/product-details/ima3303wh-nla/ Please give us a call @ 1-800-533-3249 if you have any questions.